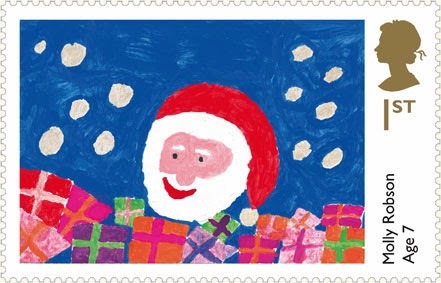 As promised Royal Mail has today announced the winners of their Christmas Design-a-Stamp Competition. The designs were chosen from 240,000 entries and were selected by a panel of judges including His Royal Highness The Prince of Wales. 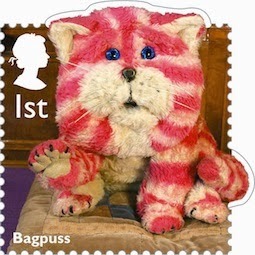 The stamps will be on sale from November 5th. 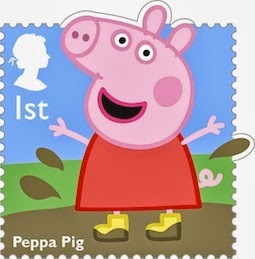 Here's Rosie's postmark, sadly we don't have a good one for Molly! 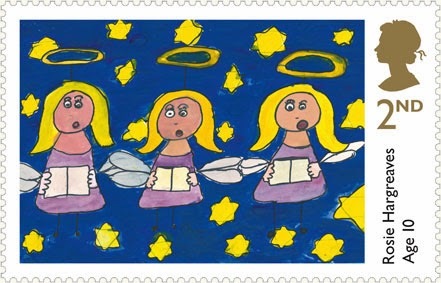 The 1st and 2nd class stamps will be issued on 5 November alongside the Madonna and Child stamps. There is a FDC and a Presentation Pack but no stamp cards. 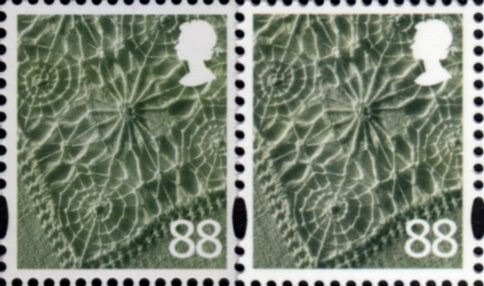 The competition stamps are self-adhesive and have been produced in what is described as 'a concertina-style' sheet of 25 stamps, similar definitive business sheets. 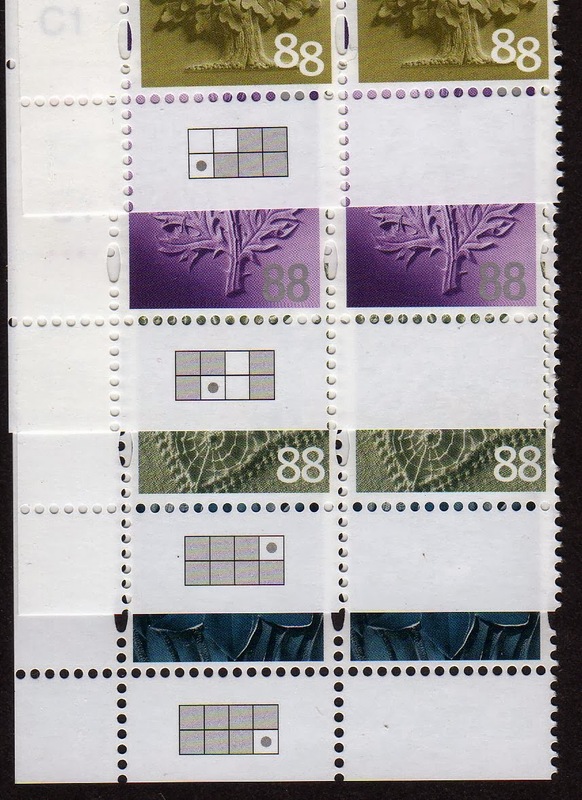 We don't have an image of this yet, but it seems they will be similar to booklets issued prior to 2006, when stamps were larger than definitive size. 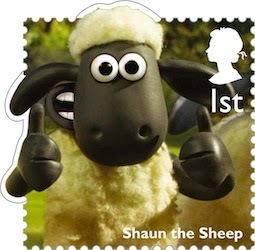 Despite the printing format, these stamps will be sold singly. The 47 x 30mm stamps are printed in gravure by International Security Printers (probably Walsall). 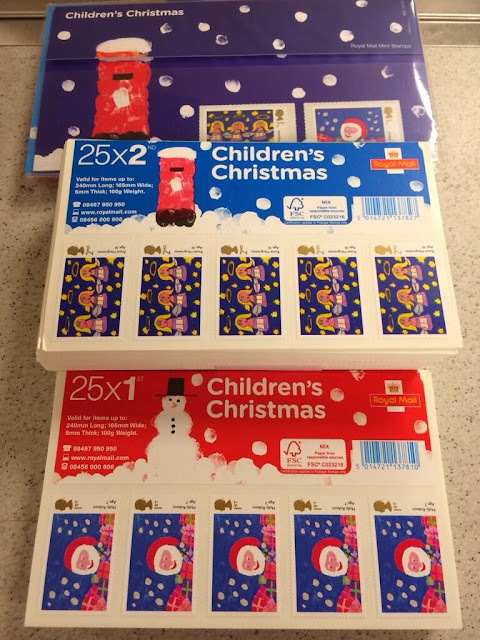 These stamps were not distributed to dealers on a standing order basis, and Tallents House have confirmed that no stamps, covers or packs will be sent to standing order customers: they must be ordered separately. Whether blank FDCs are available at POs I cannot say. 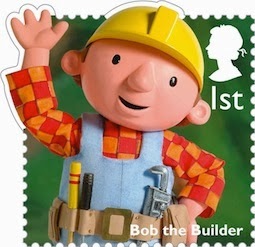 No new stamps have been discovered in the last week but correspondents have provided a couple of items of news. 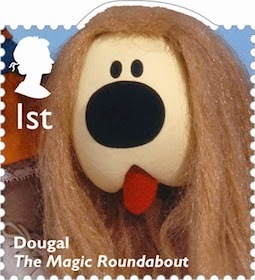 Robert reports that the self-adhesive poppy stamp is back at a local post office. He mentions the date of 11 November but I suspect they will be on sale before then. We haven't been given any official issue date. 'there has been an update to the Smilers App for the iPhone on 25 October, including adding in the ability to order multiple designs in the same transaction. We're transferring the pictorial country definitives to our new shop, which means adding some values which were never included in the old one. What shall we add next? 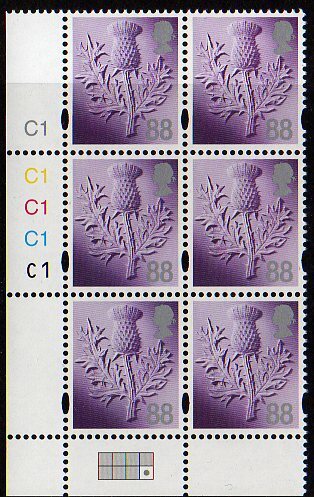 We reported in August that an eagle-eyed reader had sent us a reprint of the Scotland 88p stamp with plate numbers in a different font to the original January printing. The new plate block also demonstrated that the plate was a totally new one, despite still being plate number C1. The 14 January printing on the left had Scotland's stamp printed in grid position 8 only. 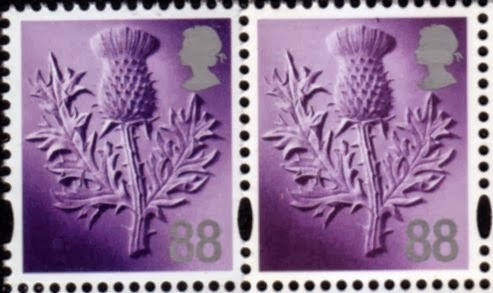 The 31 May printing has the Scotland stamp printed in positions 3, 6 and 7. 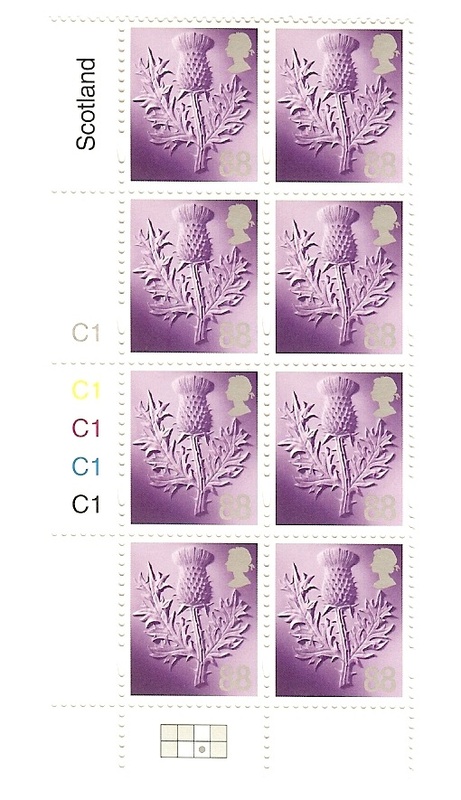 But there are noticeable differences in the actual stamps as well. Cartor Security Print have produced the original and the new printings. In all cases the original 14 January printing is on the left, and the 31 May printing is on the right. Northern Ireland, original is noticeably greener or bluer depending on your eyes/monitor. New print is grey. 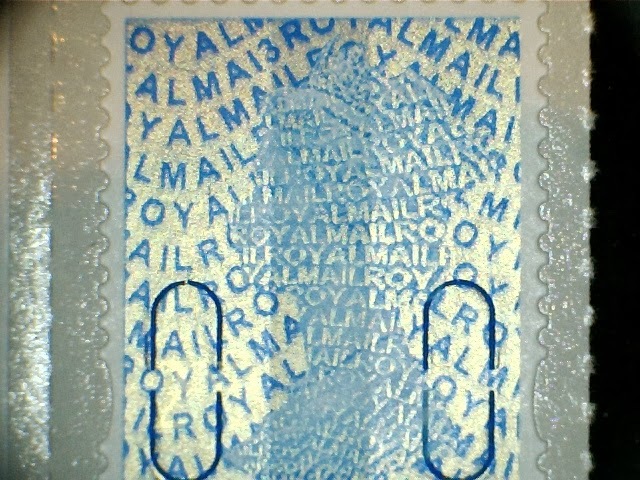 Taken in isolation the original Wales stamp seems normal but against the reprint it has a touch of pink to the blue. 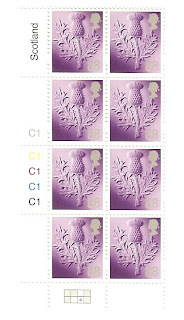 The Scotland stamp is probably the least distinguishable but the new one is lighter. 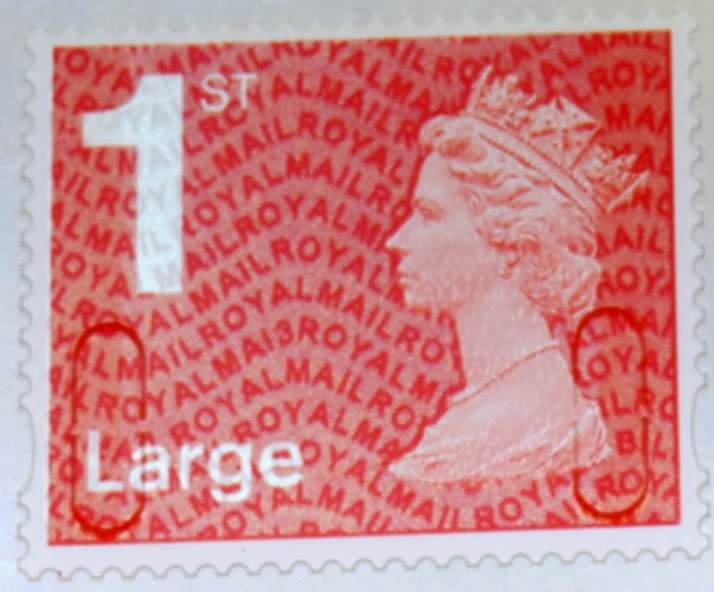 The new print of the England stamp is notably lighter than the original. 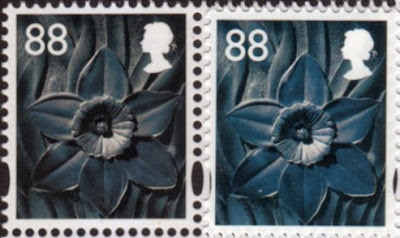 Over the years there have been many variations in the colour of this design, as different processes and printers are used, but this is the most noticeable variation on the same value. The question remains, though, how many times do the printers need to be told that a new plate should not have the same number as the one it replaces??? Examples of a new printing by Cartor of the Scotland 2nd class are also in a distinct shade, with more magenta*. 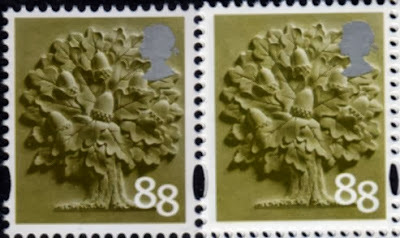 On the left, De La Rue; centre the 1st Cartor printing (24/04/12); right the 2nd Cartor printing (28/06/13). 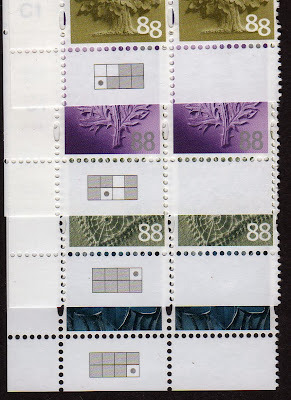 The gird formation on these is the same as before so they may be the same plates, with just a different ink mix. 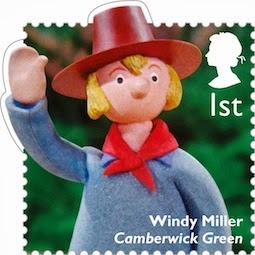 * 1st class second Cartor printing. This was also reprinted on 28/06/13 (both values are on the same press plate) but no there is no noticeable difference, suggesting that rather than 'more magenta' there is less cyan. 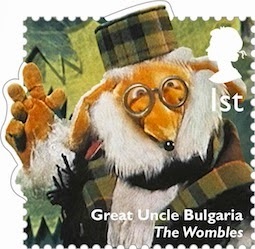 The people involved must be very honoured, but it's not much good for collectors. Having used special slogan postmarks for the 11 Doctor Whos, and the 11 Football Legends, Royal Mail has now used similar postmarks for the finalists in their Design a Christmas Stamp Childrens Competition. "To celebrate the children being the 24 finalists, their achievement will appear on a special postmark that will feature on mail delivered to addresses nationwide. Each postmark will feature one day over the next month. 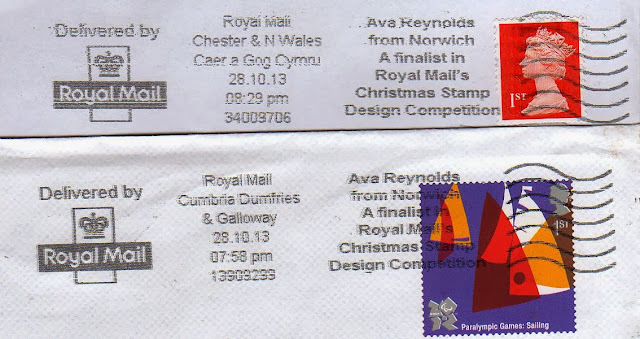 Two of the national finalists are from Wales and will have a Welsh postmark sent to addresses in Wales." 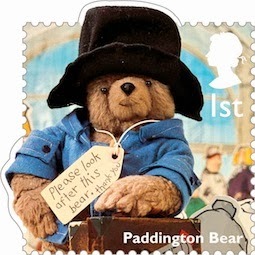 To avoid making this blog entry too big, the remaining postmarks will be shown on a new one here; the table at the foot will continue to be updated. 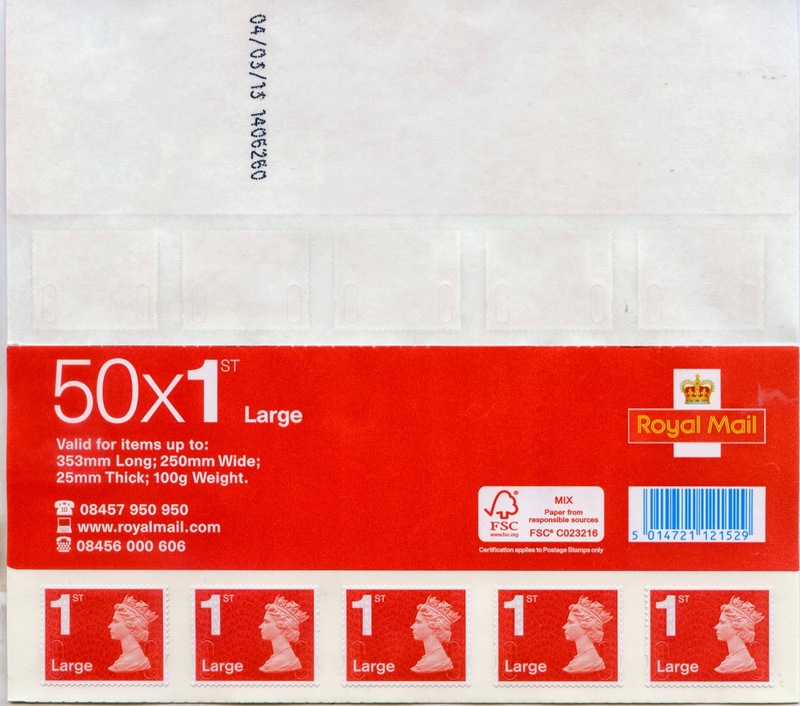 Apparently the campaign started on 3 October, with each postmark being in use for one day only (at least that is the plan, but see the detail below), running up to the announcement of the two winners on 31 October, and the issuing of the stamps on 5 November. Latest text additions will be in blue; images will be slotted in more or less in order. Thanks to John G and John A we can show these examples. 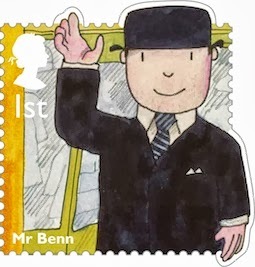 18 October Archie Hilton from Banchory, at Cambridge MC (I've also been sent examples from Bath Bristol Taunton MC, S W Wales MC and Chester and N Wales (both in English) on the same date; and Chester and N Wales and Gatwick MC on 19th. 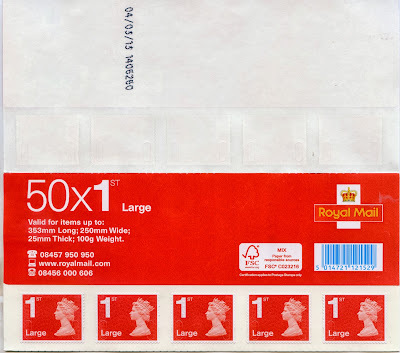 UPDATE 10 October: Collectors with more knowledge than I have - and who have seen examples - have said that, unlike the previous two campaigns, these slogans are being applied on all IMP-processed mail to any address nationwide. 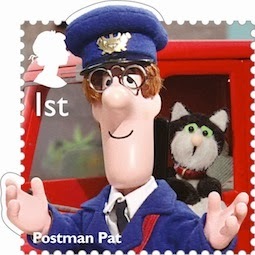 That should mean that we all see some, although it's hit and miss given the amount of mail that comes through with no postmark at all! 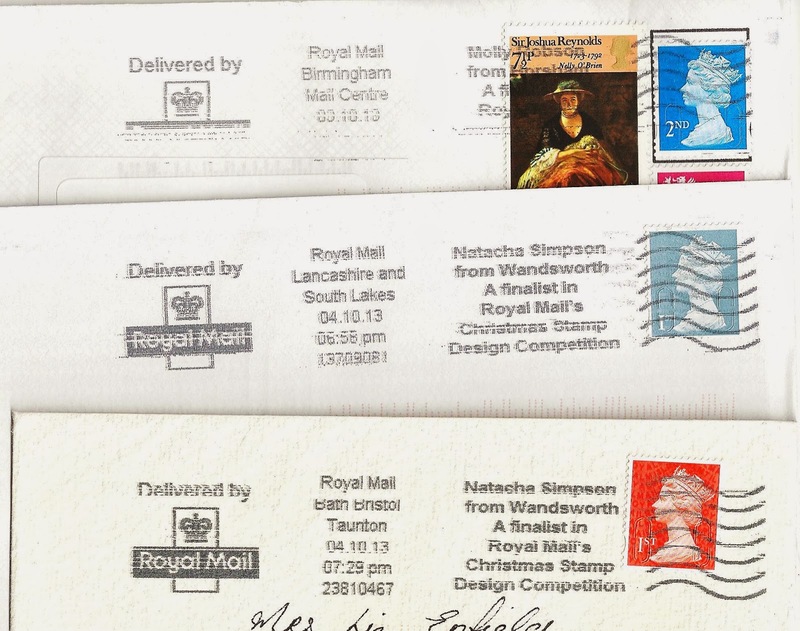 Fortunately the British Postmark Society will collate reports and publish the full results, but they still need help from all of us, not just from their members, so please send scans of any examples you see. 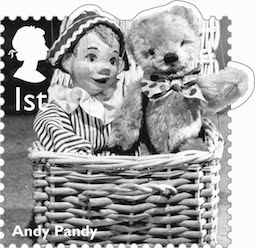 Royal Mail starts 2014 with a set of 12 self-adhesive 1st class (60p) stamps showing Classic Children's Television characters from Andy Pandy in the 1950s via Camberwick Green, Greendale and Wimbledon into the 21st century. 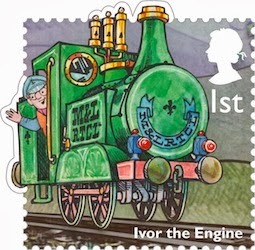 The stamps will be issued on 7 January 2014. 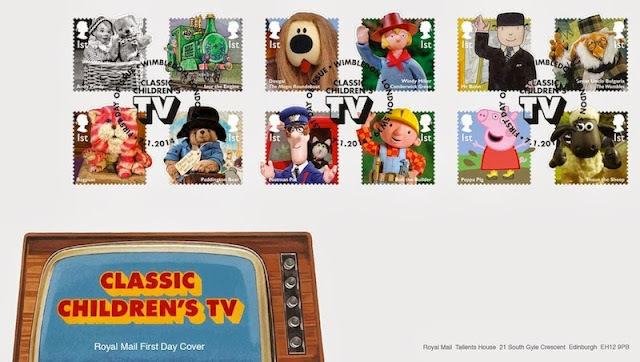 The set of 12 - Andy Pandy, Ivor the Engine, Dougal (Magic Roundabout), Windy Miller, Mr Ben, Great Uncle Bulgaria (Wombles), Bagpuss, Paddington Bear, Bob the Builder, Postman Pat & Jess, Peppa Pig, and Shaun the Sheep. The self-adhesive stamps will be printed in two sheets of 30/60 by International Security Printers, in gravure.